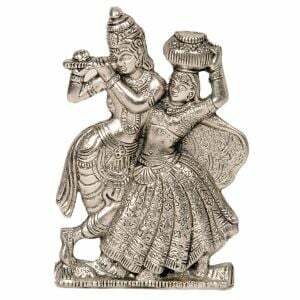 This handcrafted antique idol of Lord Krishna with Radha on metal durable stand is made of pure white metal. The idol is silver polished to give it alluring antique look. It is also an ideal gift for your friends and relatives. The gift piece has been prepared by the creative artisans of Jaipur. It is an exclusive show piece for your drawing room; sure to be admired by your guests.